The new Ariston is more than just a pretty water heater. Take a look inside our new GL Series and you'll find some exceptional inner qualities as well. Redesigned from the ground up by the world's leading point-of-use water heating manufacturer, the new GL Series features a 6 Gallon Plus model, glass lined tanks, and a 6 year warranty. Did you know that over 80 billion gallons of water are wasted in the U.S. every year due to long waits for hot water at the tap? 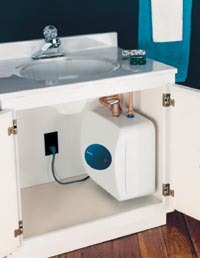 Ariston mini-tank, point-of-use water heaters save water and money by providing instant hot water at the tap. The powerful 1500 watt elements dramatically reduces recovery time, and the glass-lined, well-insulated tank minimizes heat loss. And we have so much faith in the performance of the new GL Series, that we're offering a 6 year warranty on the tank. Finding the perfect match for you is a snap. 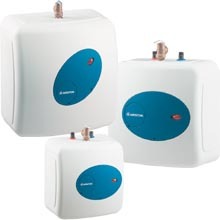 Ariston point-of-use water heaters are designed to supply instant hot water to sinks in kitchens, bathrooms, in homes, restaurants, and in offices. Refer to the chart below to select the model that corresponds to your intended use and the number of sinks the heater will be providing hot water for. Before making your final decision, also consider the location where the heater will be installed. The GL2.5 and GL4 are designed to fit under most sinks. The GL6 Plus is generally too large to install directly under a sink, but this model offers the flexibility of being mounted vertically or horizontally. Simply tap into the cold water line and install the heater directly at the sink. Ariston heaters may also be installed in-line with a larger hot water source, such as a Bosch AquaStar tankless heater, or a storage tank heater. Lightweight and compact, all three Ariston electric mini-tank models plug directly into a standard 110 volt outlet. The Ariston GL6 Plus can be mounted vertically or horizontally. All models include a mounting bracket for wall hanging, or the unit can sit directly on the floor. 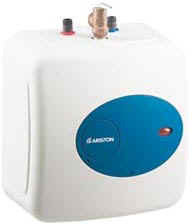 Dimensions 14" x 14" x 10�" 14" x 14" x 12�" 17�" x 17�" x 14�"
Ariston, through its U.S. distributor Controlled Energy Corp., (hereinafter CEC) guarantees this water heater to the Owner (hereinafter "Owner") of the water heater at the original installation location against defects in material or workmanship for the periods specified below. 1. The Inner Tank - If the inner tank leaks within six (6) years from the date of original installation of the water heater, because of a defect in material or workmanship, CEC will furnish to such Owner a new heater of the then prevailing comparable model. 2. 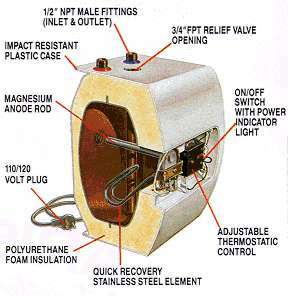 Any Component Other than The Inner Tank - If any other component part (other than the inner tank) proves to be defective in material or workmanship within one (1) year from the date of original installation of the water heater, CEC will furnish the Owner with a replacement of the defective part(s). Important: Owner shall keep this certificate. 2. Owner should submit the warranty claim directly to CEC at the address listed below, and they will arrange for the handling of the claim. 3. Whenever any inquiry or service request is made, be sure to include the water heater model number, the date of manufacture, date of installation, Dealer's name, and the watts and voltage.